Pour milk into a non-reactive, 5-quart pot. Heat over medium heat until it reaches 85°F. Stir it regularly. Dissolve citric acid into 1 cup of water and stir into the milk. Continue to heat slowly until the milk reaches 100°F. Dissolve rennet into 1/4 cup water and stir into milk. Stir the milk for 30 seconds, continuously, in an up and down motion. Curds will begin to form. Continue to heat the milk until it reaches 105-110°F. At this point, remove the pot from the heat, cover the pot and let it sit, undisturbed, for 10 minutes. Once curds have formed completely, use a slotted spoon to transfer the curds gently to a colander. Try to get as much of the curd as possible without breaking it up too much. Let curds drain in a colander, and press them lightly with your hands to press out as much whey as possible. Be careful not to push the curds through the colander, though. Transfer curds to a microwave safe dish and microwave on high for 75 seconds. Use a metal spoon to stir and fold the curds over until they turn silky smooth. The curds should be pretty hot to melt together. You might need to microwave the cheese for another 30-60 seconds to get the right consistency. Continue to fold curds over with a spoon until it forms a smooth ball. As you work the cheese, sprinkle in the salt. Drain off the whey that pools occasionally. When cheese curds are smooth and silky, use a hand to lightly knead and fold the curds. It helps to wear a rubber glove to protect your hand from the heat. If the curds aren’t easy to work with, microwave for another 20-30 seconds to heat them up. When the cheese reaches the consistency you like, form a smooth ball out of the cheese. If you’re going to refrigerate the cheese, dunk the ball into ice water to set it in shape. The cheese can be eaten immediately or refrigerated for up to a week. To refrigerate, place the mozzarella in a small container. Mix a cup of cool whey with a teaspoon of salt and pour the mixture over the mozzarella. Cover the container and refrigerate. While you can use 2% milk, you'll have better results with more milk fat, so whole milk really is best. Also, avoid ultra-pasteurized milk, which won't lead to good curd formation. You can also store the cheese refrigerated and simply wrapped in plastic, but it may not retain its flavor and consistency as well. Oh yes, you can and oh yes, you should! 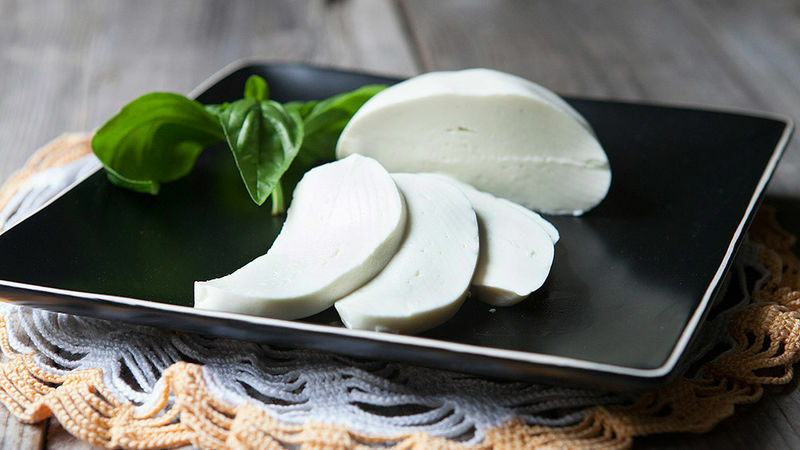 Making your own mozzarella cheese at home may sound intimidating but if you knew it would only require less than an hour of your time and four ingredients, would you be persuaded? You are likely familiar with all of the ingredients that this recipe calls for but maybe be thrown off by the citric acid. Before you dismiss this recipe because you don’t have citric acid in your kitchen or even know what it is, you should know that citric acid is simply a food additive used to preserve food and add a tangy, sour flavor to foods. You can find it at your grocery store, likely in the canning aisle. See? There’s really no excuse to not make your own cheese. If it still sounds intimidating, we broke down the basics for you in our how-to article.